Congrats! Meanwhile, I'm currently working on the graphics of the next contest...to say nothing of what's planned for December and January....so stick around for the next big thing! You can find more details about the event here. There is going to be craziness. Also a big giveaway. And candy. And more. You want to be there, that's what I'm trying to say. So, yesterday I read Sarah J Maas's post about NaNoWriMo. For those of you who've not heard of it, NaNoWriMo is short of National Novel Writing Month, and is basically a time in November for authors to go insane attempt to write 50k words of a novel in a month. I've never done it before. I have written 50k in a month before--on rewrites, which means I've already got the basic novel done in a draft form, making it much easier to do the massive word count in one go. I've not really timed myself before, but I don't think I've written 50k of a new draft in a month. And I've never participated in NaNoWriMo for another reason--I've never been in a situation where November provided me with a good opportunity to start a new project (because, of course, the idea is to start--and finish--something brand new in a month). I usually draft in the summer and revise in the fall and winter, so November has been a bad month for me to participate. This year, I find myself in the last week of October with a shiny new idea. And a need to finish a new draft. 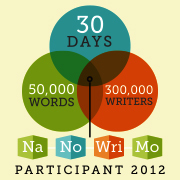 I got on Twitter and mentioned NaNoWriMo, and several friends immediately said they were participating, too. And...well, let's just say that I can recognize the fates lining up when I see them. So I did it. I signed up for NaNoWriMo. Will I finish 50k of a new book by the end of November? Honestly, I don't know. On the one hand, I have a lot of travel lined up for November--I'll be gone literally half the month. On the other hand, carpe diem. What about you? Have you ever participated in NaNoWriMo? Why/why not? Any pointers? They really shouldn't let me out in public...but they did! 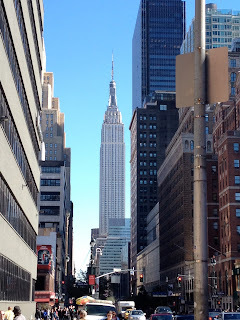 And last week, I ran away to New York City for adventures that included ComicCon, more fancy meals than I can count, books, book signing, and JK Rowling. author of Wicked, which is the base for one of her favorite Broadway plays. And then...NY ComicCon! 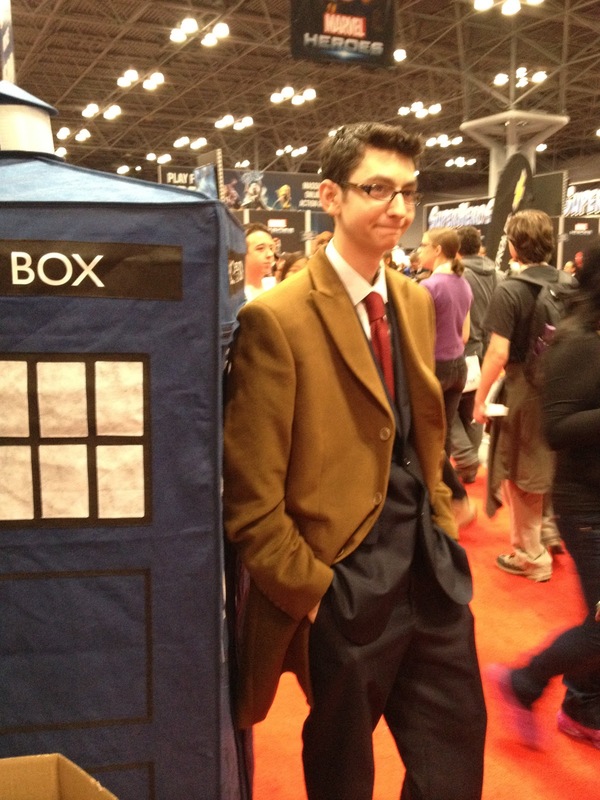 ComicCon is basically a haven for nerds like me. It is where I am among my people. I waited in line for nearly an hour to attend this panel! One of my favorite events at ComicCon was Geek Geek Revolution, where Colleen Lindsey quizzed authors on their geekiness. I tried to cheat by going to the first panel on Saturday so I'd know the answers for when I went on Sunday. And as winner, Geek Queen Andrea Cremer won Rock'em Sock'em Robots. The other place I hung out at was the Penguin Booth. Yay Penguin!! for a signed ARC of Shades of Earth! 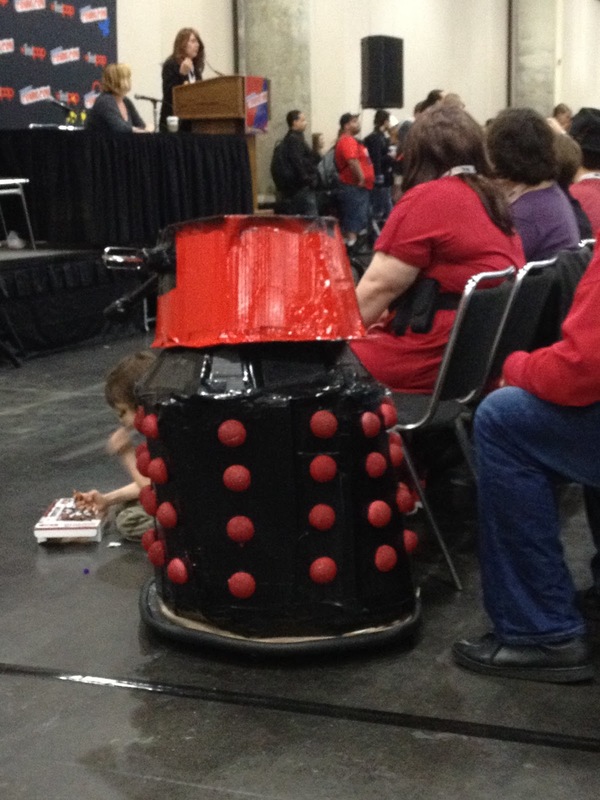 People waited an hour to come to the panel! We ran out of room and had to turn some people away! but the line ends at Andrea's. But there was also a lot of nerdy fun to be had at ComicCon--including the floor, which was full of awesome people that I tried not to geek out on. 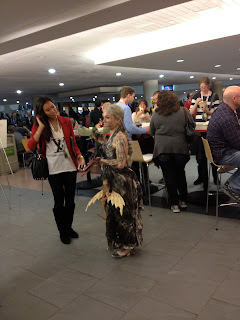 And the floor of ComicCon is always made more awesome by the costumes. Guys. 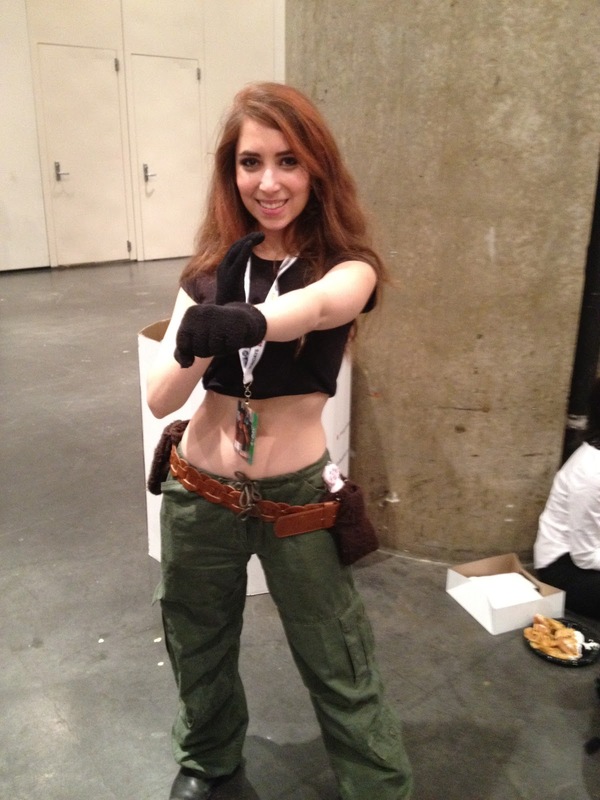 NYCC brings cosplay to a whole new level. 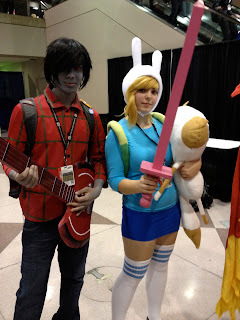 Adventure Time was the big cosplay winner this year. This one had one of the best Ice Kings (and Gunter!). 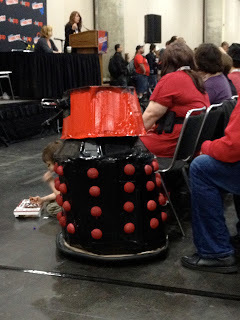 This little dalek had a kid inside! 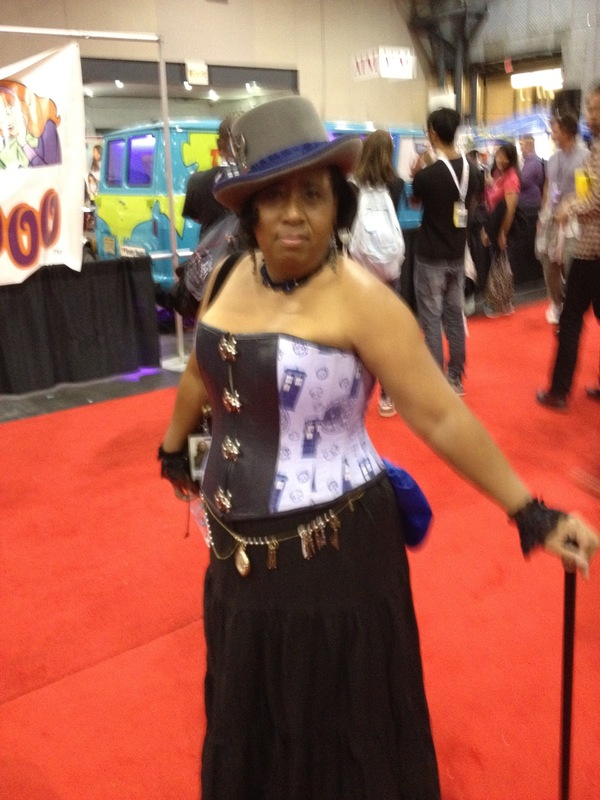 A little blurry, but I thought this lady's TARDIS outfit was charming-complete with keys and watches around her waist! The only thing more popular than Adventure Time was gender-swapped Adventure Time. This might have been the best Fiona--I love that she also had Cake--and Marshall was so good. He even had red eye contacts! Two Doctors, a Rose, and a Statue. 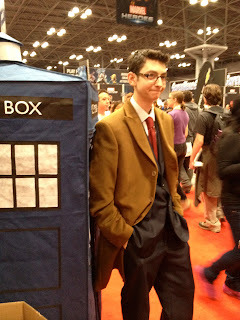 This Doctor carried his TARDIS around with him. I thought this was so creative--Lumpy Space Princess and Turtle Princess. These girls rocked it! Throwback! This Kim Possible had me cracking up--note the naked mole rat in her pouch. 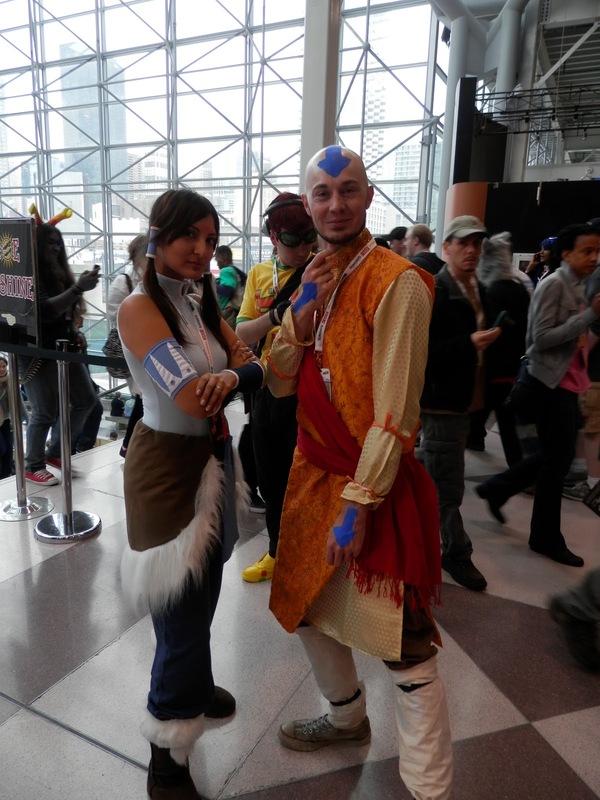 Benders were also a popular choice for cosplay costumes. Love these two--and their pose was perfect!! Sailor Moon was also popular! Here's a great Tuxedo Mask and Sailor Pluto with her. A great Aang and Katara! THIS is what it's all about--a kid excited to explore the world of fiction. Anyway, Lauren had been telling me how great MAC makeup is, and I needed some new foundation...and lip gloss...and eye shadow...and anyway, let's just say that I'm glad my husband didn't mind me going on a little shopping spree! 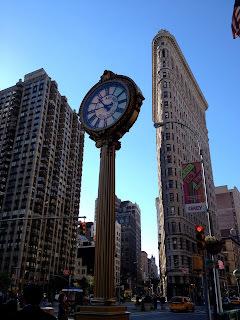 After spending all my money between Macy's and Lush, I walked around NYC and visited some of my favorite places. I almost don't feel as if I'm in NYC without seeing the Flat Iron Building. 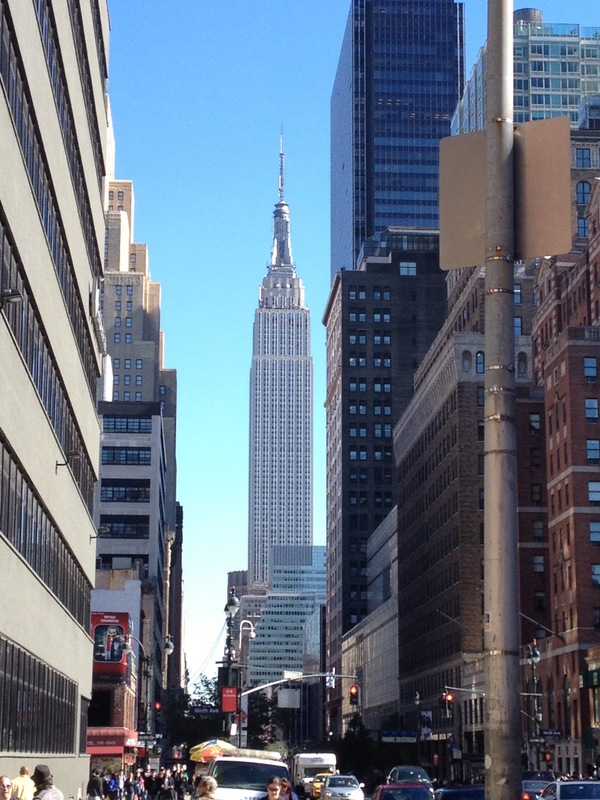 No matter where I went, I could always see the Empire State Building. 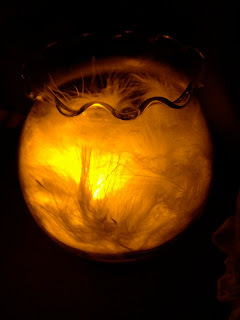 It was like the Northern Star. Almost as fun as real shopping is window shopping, and NYC has the best! 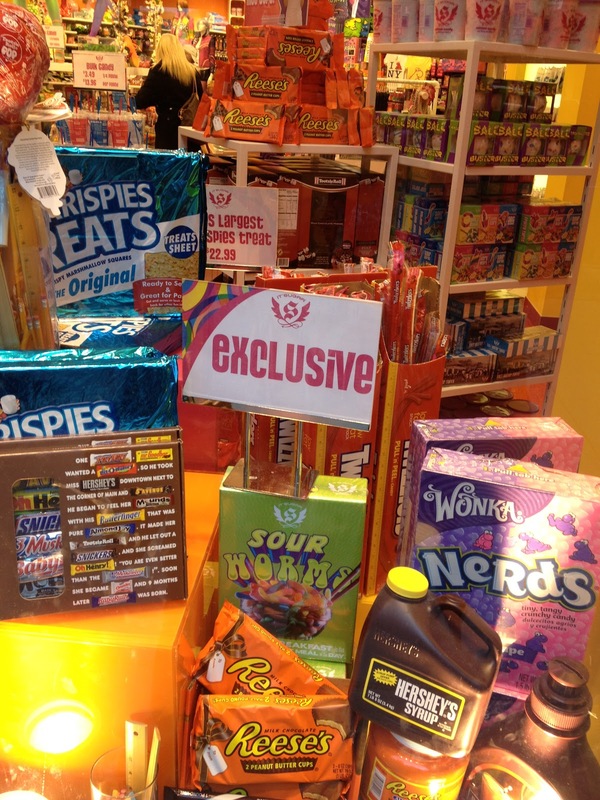 To give you an example of size, the Hershey's syrup is a gallon. The Nerds box is as long as my arm. 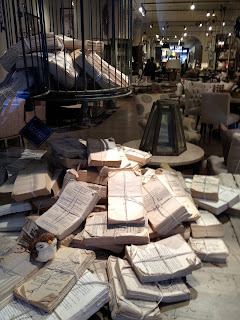 I think this was an interior design store. I don't know. I got distracted by the pretty store front. I also found my way into one of the NYC Public Library branches. What can I say? I'm attracted to books. 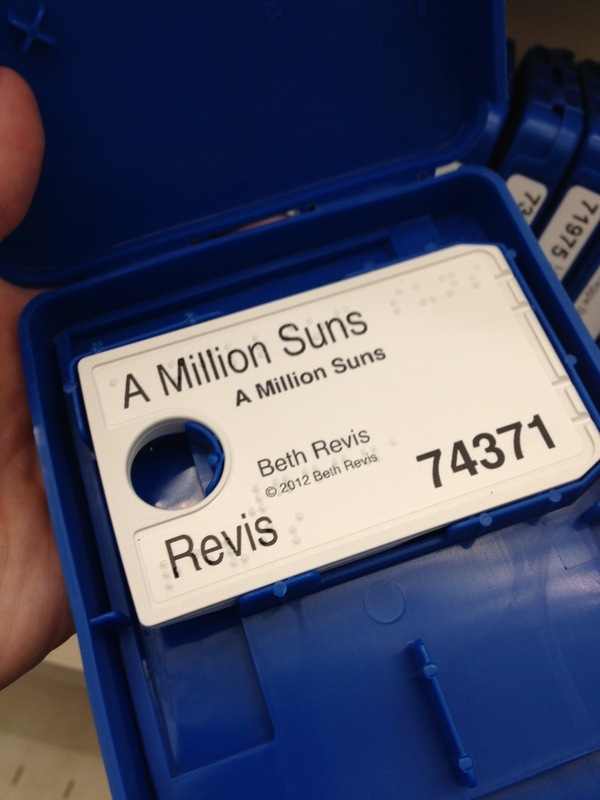 And I'm glad I wandered in--this branch had braille books, something I'd never seen before. It was designed almost like a cassette tape. Anyone know how these work? There were also two things that I scheduled for NYC just for fun--on Monday, I went to see the avant garde play Sleep No More, and on Tuesday...on Tuesday I got to see JK ROWLING! Sleep No More is...a strange play. It's loosely based on MacBeth, and instead of a stage, it takes place in a hotel. Five floors, all with something going on. You chase the actors around and try to catch the strings of the plot. I definitely recommend seeing this play--it's an experience unlike any other! You can't take pictures inside Sleep No More--this is the candle display on the tables. The whole set-up was like a 20s party...with MURDER. And, for the grand finale! JK ROWLING!! 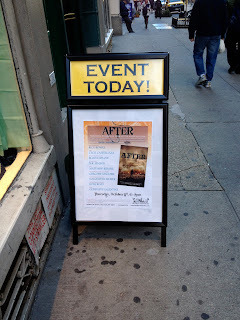 She did one event in North America--in NYC. And tickets sold FAST. I am HUGELY grateful for the wonderful people at Hypable who were able to hook me up with tickets. The event was...magical. Amazing. Fascinating. Everything I'd hoped it would be. The stage before the event. Of course they set out water in goblets. In the signing line, JK Rowling made an effort to look into each person's eyes and respond to him or her. Here she is signing my copy. I may have been so excited that I nearly threw up. Me with JK in the background! This picture was taken by the wonderful Victoria Schwab, and my only regret is that I forgot to get a group picture with her and Michelle and Lev (also in the background). PS: For excellent coverage on The Casual Vacancy, check out Hypable's complete list here! Interview Up on The Hub! I'm a bit under the weather at the moment, but I wanted to post the interview The Hub put up. Commenting on that interview will also garner you extra entries in the giveaway for Shades of Earth! GUYS GUYS GUYS I CANNOT EVEN. Remember when I asked you to vote for this? The YALSA Teens' Top Ten Award? You--you--put me on that list. I made the list!!! ACROSS THE UNIVERSE is a 2012 YALSA Teen Top Ten!!! AHHHH!!!! This award means so much to me, guys. SO much. Because it's from YOU. I don't know what to do but effusively thank you over and over and over again, but there's one thing I can do to give back to you. I can give you a copy of SHADES OF EARTH. One of my favorite picture book writers is (big surprise) Maurice Sendak. I think I love his work because he recognized, moreso than most other people and especially most other picture book writers, that children are savage little monsters. Don’t get me wrong—adults are savage big monsters—but children are often glorified to a status of sweet and young and innocent, and people, especially adults who are trying to write for children, forget that they are little beasts. And herein lies my idea for what separates MG and YA books in terms of character. (For what separates YA and MG books in terms of plot, click here). It is essential that, at some level, the author recognizes that children are savages. At it’s most basic level, this is a warning that your childish characters cannot all be sticky sweet. Even Encyclopedia Brown, which is about as safe and clean as you can get, has a bully. Many authors have too-fond ideas of what children are, and they write stories about the perfectly sweet young ‘uns that live to bake cookies with grandma and say things with a cute lisp and try to sell lemonade on the street corner, but they spell the sign with a backwards “E” that looks even cuter. Look, there is a place for such things. Mostly in Hallmark Cards. Children are cruel—oftentimes crueler than adults. Adults have learned to tamp down their basic instincts, either in order to fit in with society, or because, through experience, they’ve learned the consequences of their cruelty. Children have not. If you want to write an honest book, you have to recognize this basic fact. And in fact, this is a wonderful thing. When you hear someone say “look at the world through the eyes of a child,” I do NOT want you to picture the rosy-pink idealistic world that is so often imaged. Peel away the layers of civilization and societal rules that adults learn while growing up and peer into the face of the monster. Good books—I mean the really great, remarkable, life-altering books—are honest. And a book with children as characters has the capacity to be the most honest book in the world, because children are honest in the most basic, blunt ways. I’m not talking about fiction and nonfiction here. I’m talking about truth. The best middle grade novels recognize that children are savages. The best middle grade authors recognize that we all are. Somewhere in growing up, we tamp down the monster. That’s a part of growing up. That’s what separates the child from the adult. Being a teenager means that you’re in that transition period to becoming an adult. You put aside the things of your childhood. You start to make choices about who you want to be and what you want to do. And somewhere in there, you start to wear a mask. To some extent, every single adult wears a mask. (Exception: The Incredible Hulk.) We have to. Because we are savage on the inside, and we don’t want to be. For whatever reason—to fit in, to be a better person, to do what’s morally right instead of what we want to—we don masks. When you smile at that girl who talks behind your back instead of punching her teeth in? Mask. When you pretend to be sad that guy lost his job, even though he’s a total loser? Mask. When all you want to do is stay at home in your pjs and watch bad movies but instead you get up and go to work? Mask. And, because we are, at the basic level, truly savage littles beasts (see: childhood), if you peel the masks away and away and away, you can see the savage, even in the adult. Have you seen the movie Schindler’s List? This is the best possible example I can give. Goethe’s character and Schindler’s characters are wonderfully juxtaposed. Schindler wore the mask of a ruthless business man, but when you peeled it away, you saw the good man beneath. Goethe wore the mask of an upright, loyal citizen…but when you peeled that mask off, you saw the monster within. When you’re a teenager, there comes a moment when you realize that everyone you know and love wears a mask. Good YA books show this in some way. It can be a book where the main character realizes that a parent is only human and cannont solve her problems. Or perhaps he falls in love…and out of love. Whatever way you look at it, the main character learns at some level to look beyond the mask, to see the people for who they truly are. This is the moment when Luke Skywalker learns that his father is Darth Vader. In great YA literature, though, the main character doesn’t just realize that everyone wears a mask. In great YA literature, the hero realizes that HE wear a mask, too. He rediscovers the savage within, he becomes who he thought he couldn’t be. It could be that he thought he was tough and discovers his weakness. It could be that he thought he was weak and discovers his strength. This is the moment when Luke considers joining the Dark Side. When Schindler gets his gold ring. When Frodo doesn’t get rid of his gold ring. When Lear faces the storm. When Aerin faces Maul. When Edmond fights the White Witch. When Harry turns away from the Mirror of Erised. But there’s one more level. This is what separates the very best of the best YA. Good YA has the character realize everyone wears a mask. Great YA has the character realize he wears a mask, too. The best YA lifts the mask off the reader. There is no greater accomplishment than a book that can make the reader realize who he is behind his mask. 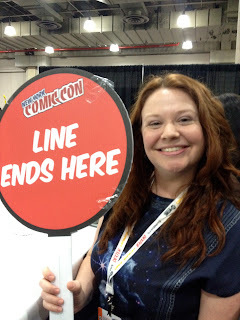 There's been a slight change of plans with NY ComicCon--one program is being switched days, and I now have an exact time for the signing of Shades of Earth ARCs. HOCUS POCUS: MAGIC & MONSTERS IN SCI FI AND FANTASY. Saturday, 1:30-2:30pm, followed by a signing by all participating authors. 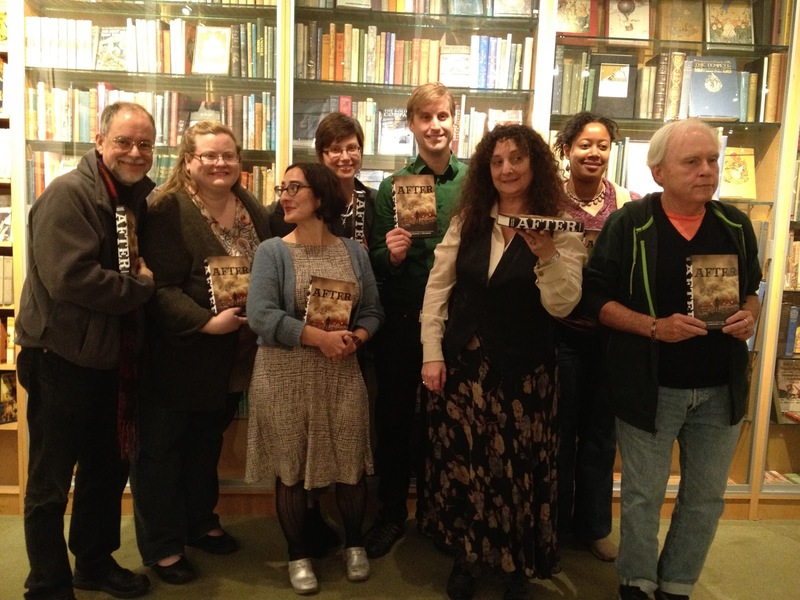 With: Andrea Cremer, Cecil Castellucci, Jacqueline Carey, Jocelynn Drake, Kim Harrison, Max Gladstone, Richard Kadrey, Victoria Schwab. Guys? Guys? I'm a moderator. I'm MODERATING. EEEP! We're talking all about monsters and the things that go bump in the night. Come! !More details here. 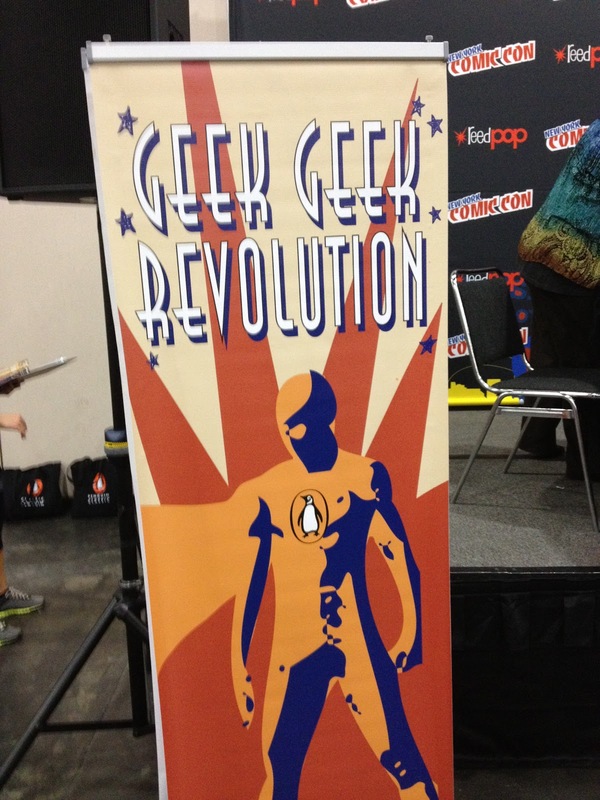 DATE/TIME CHANGE: GEEK GEEK REVOLUTION: Sunday, 12-1pm. 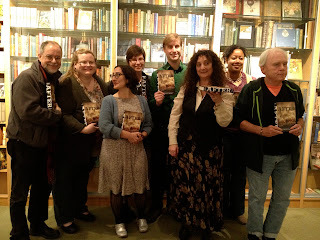 With: Anton Strout, Andrea Cremer, Colleen Lindsay, Myke Cole. More details here. This is a question based game-show where we're all competing for the chance to be TOP GEEK. And there will be prizes for the audience!